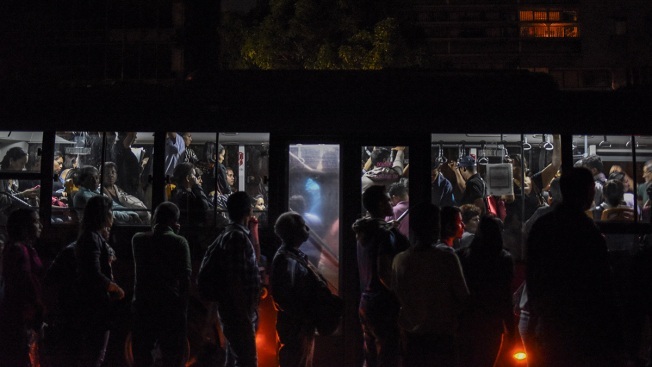 Residents stand on line for buses during a major blackout in the Chacaito neighborhood of Caracas, Venezuela, on March 7, 2019. Venezuela's worst power and communications outage on Friday deepened a sense of isolation and decay, endangering hospital patients, forcing schools and businesses to close and cutting people off from their families, friends and the outside world. While electricity returned to some parts of Caracas nearly 24 hours after lights, phones and the internet stopped working, the blackout was another harsh blow to a country paralyzed by economic and political turmoil. Many of the few shops that were open were only accepting cash because without electricity and the internet they couldn't process debit card payments, a common method of doing transactions in Venezuela since hyperinflation transformed the bolivar into one of the world's most worthless currencies. "I'm desperate," said Maria Isabel Garcia, a 39-year-old office worker who hadn't been able to cook anything for her three young children. She had planned to buy empanadas but had no cash because the bank didn't have any when she went there on Thursday. Another Caracas resident who is diabetic was searching for ice to preserve his limited supply of insulin medication. Venezuelans are accustomed to power cuts, but nothing like the one that hit during rush hour Thursday evening, sending thousands of people on long nighttime treks in the dark to their homes. It reached virtually every part of the oil-rich country of 31 million, which was once Latin America' wealthiest but is now beset by shortages and hyperinflation projected by the International Monetary Fund to reach a staggering 10 million percent this year, compelling about one-tenth of its population to flee in recent years. The blackout promptly became a point of dispute between President Nicolas Maduro, who blamed sabotage engineered by the "imperialist United States," and U.S.-backed opposition leader Juan Guaido, who said state corruption and mismanagement that have left the electrical grid in shambles were the cause. Guaido, the leader of Venezuela's National Assembly, returned from a Latin American tour to Venezuela on Monday in order to escalate his campaign to topple Maduro and hold elections. Those who have left Venezuela include many with valuable energy expertise, and the government's allegations of a saboteurs' plot was met with skepticism by many in Caracas. "They always say the same thing," said Carlos Ramos, an economist who was waiting to see a doctor outside the darkened lobby of a Caracas hospital. Elsewhere in the city, Dr. Luz Ardila Suarez, a gynecologist, said many staffers at the hospital where she works were still on the job Friday morning because they couldn't get home the previous night. She said the hospital generators had enough fuel for another day or two and that she was especially worried about patients in intensive care. "There are patients who are connected to machines," Suarez said. 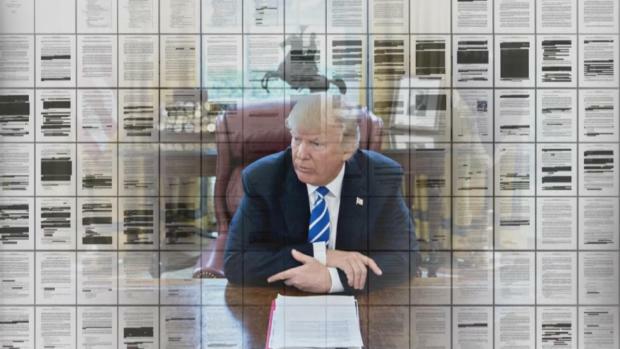 "And of course, there's no water." 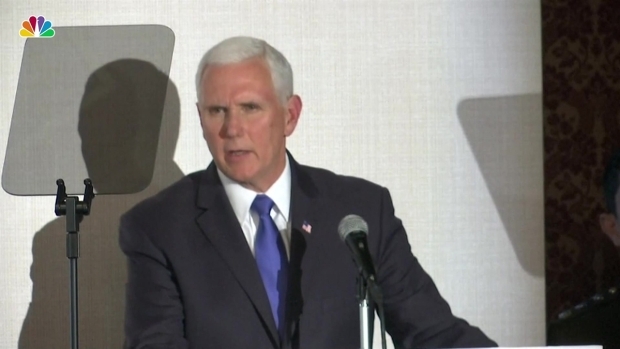 Vice President Mike Pence on Monday announced new sanctions against Venezuela’s Nicolas Maduro and his supporters. The director of CODEVIDA, a coalition of Venezuelan health advocacy groups, reported that thousands of dialysis patients were going without treatment as a result of the blackout. While some hospitals were able to rely on back-up power sources, others were dark. By early Friday afternoon, residents and pro-government state broadcaster VTV reported that power was returning to parts of Caracas. Traffic lights in several neighborhoods were back on, while at one office building the electricity flickered to life and then turned off. Still, Venezuela's economic woes are likely to increase as U.S. sanctions against its oil industry take their toll, part of an international effort to push Maduro from power. The United States and about 50 other countries back Guaido's contention that he is the interim president of Venezuela, and that Maduro's re-election last year was illegitimate because major opposition leaders were barred from running. Guaido and Maduro, whose chief backers are Russia and Cuba, planned rival demonstrations on Saturday as they seek to energize supporters. "The electricity war declared and directed by the imperialist United States against our people will be overcome!" Maduro wrote on Twitter. The state-owned electricity operator blamed the outage on an act of "sabotage" at the Guri Dam, one of the world's largest hydroelectric stations and the cornerstone of Venezuela's electrical grid. Information Minister Jorge Rodriguez described it as a "cyber" attack intended to derail the whole system. Venezuelan Defense Minister Vladimir Padrino Lopez echoed the official line, saying there had been a "new aggression" against the country's power system that was aimed at destabilizing the country. The leadership of the security forces has remained loyal to Maduro despite appeals from the opposition to turn against him. U.S. Secretary of State Mike Pompeo said Maduro was to blame. "Maduro's policies bring nothing but darkness," Pompeo wrote on social media. "No food. No medicine. Now, no power. Next, no Maduro." High-ranking officials have been accused in U.S. court proceedings of looting government money earmarked for the electrical system. Venezuelan authorities routinely accuse the opposition of sabotaging infrastructure, though rarely provide evidence. The government keeps home power bills exceptionally low — just a couple dollars a month — relying heavily on subsidies from the Maduro administration, which is under increasing financial duress. Venezuela's normally hyper-active social media was muted during the blackout. Those who managed to get a signal used the hashtag #SinLuz — without light in English — to share images of cities resembling ghost towns. One user posted a video of a nurse manually pumping air into the lungs of an infant. Others posted photos of long lines of cars at gas stations in hopes of getting fuel. A man anguished that he'd gone 17 hours without hearing from his mother. Netblocks, a non-government group based in Europe that monitors internet censorship, said online connectivity data indicates the outage is the largest on recent record in Latin America. As the blackout wore on, Venezuelans already struggling to put food on the table worried the little they have would get spoiled in fridges without power. Business owners griped over losses certain to compound an already bleak economic outlook. "I can't work. I can't do anything," said Veronica Padrino, a lawyer who attended a women's day rally in Caracas. "I can't communicate with my family." 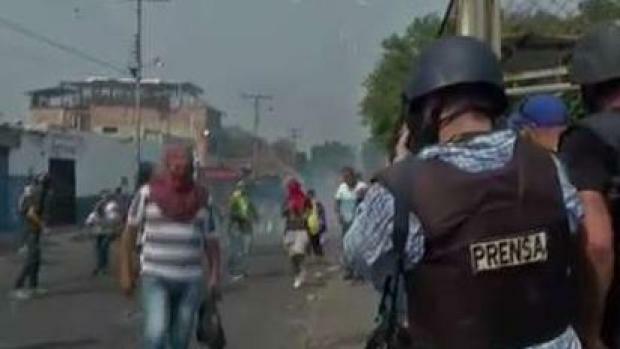 Associated Press writers Jorge Rueda in Caracas, and Christine Armario and Joshua Goodman in Bogota, Colombia, contributed to this report.